26 April 2017 — written from the perspective of a computer security analyst. 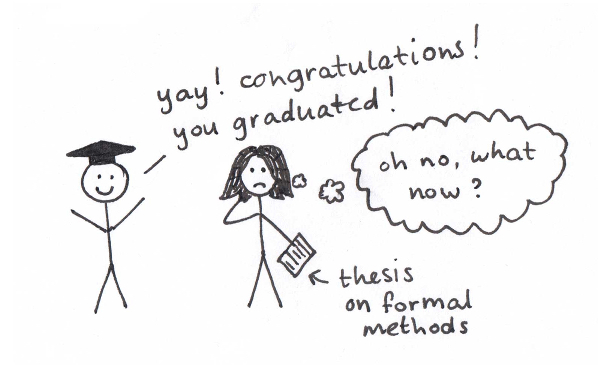 As I was finishing the last chapters of my thesis in September 2015, preparing slides for my final presentation and fighting with a particular tricky LaTeX module, a voice in the back of my mind reminded me that I needed to find a job. Part of me believed that a suitable PhD position would turn up. But the more time I spent doing research for my master thesis, the more I wanted to do something else for a while. Something not quite like research. But what? It turned out I had only a vague picture in my mind about Life After Graduation. I halfheartedly looked up a few vacancies online, but that didn’t help me at all. As someone who never had a job in IT before, the job titles, descriptions and lists of requirements didn’t really mean anything to me. As a starting point, I decided to research companies that I knew from word of mouth. However, I was only familiar with organisations where I knew people, the companies that sponsor the student associations and the companies that give lectures at university, mostly for recruiting purposes. Many of these organisations either had nothing to do with computer science, or were small (web) development companies looking for junior coders. Not really my cup of tea. This was the point where I decided to do things differently. As I learned in a training recently, when you have a to process a lot of information to make an informed choice, it’s better to search for information based on your objectives, instead of trying to process everything there is on offer. If you try to process all information that you can possibly get, your brain easily gets overloaded by all the options and the decision-making process becomes less effective. In other words: it was time for a demand-driven job search. I had to find out what I wanted from a job, and then find out which employer could provide this. However, when you’re knee-deep in mathematical proofs and you’ve never had a full-time job in your life, it’s kind of hard to come up with a complete picture of your own wishes. I decided to make a list to help me with this. I started out by listing my strong points, the things that make me stand out from others, and the things I like to do best. 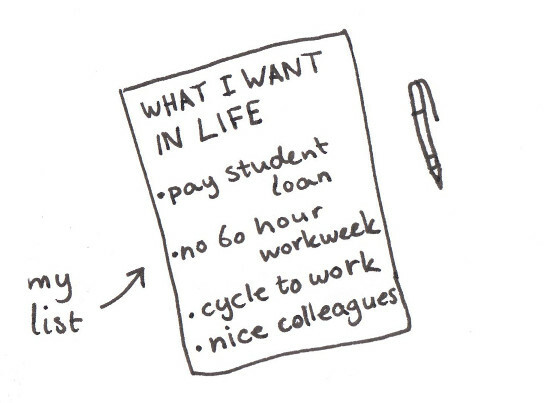 I also wrote down what I wanted my life to look like after graduation. I figured that if you spend 30-50 hours a week at your work, it’s going to leave a big mark on your daily life, right? I also made a mind map of different possible career paths. Since I have many different interests, there were a lot of different career paths I could choose, in many different fields. I decided to draw a mind map to plot all the different courses of action. I hoped it would help help me choose between them. I wrote my four major options in the corners of a large blank paper. For each option, I wrote down possible employers, the things I needed to learn to work in that field, the most interesting subjects, the pros and cons of this career path, etc. Science journalism, philosophy of science, the role of science in society. I thought I’d choose one of these careers, which would automatically rule the other ones out. Now that I have a little more work experience, I don’t think it has to be so black and white. I think it’s perfectly okay to have multiple interests and career paths. Actually, I know one full professor who changed his specialisation when he was in his fifties. It is possible do an internship at a journal? 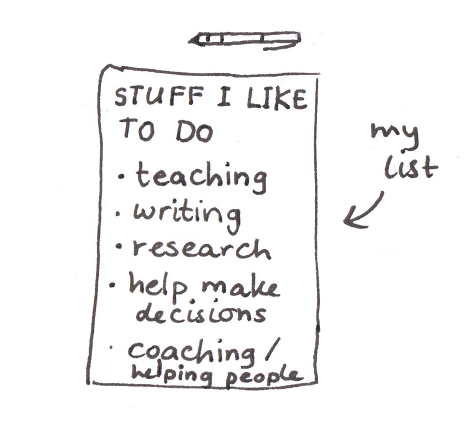 I used the lists and the mind map as a compass for my job search. Now I could specify what I wanted, I could start searching specifically for jobs that had to do with my interests, or that come with the activities and work environment which I would like to have in a job. 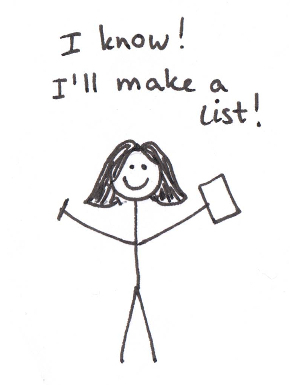 I still have the lists and mind map. I review them occassionally, to see if my opinions have changed over time. In retrospect, the things that I wrote down were very useful. Nice colleages, freedom to manage my own time and an employer that values my expertise were the most important requirements for me to be happy in my job. I was lucky to find a job that had these requirements. I’ve been working happily at my first job for one and a half years now. I hope this method helps you in your own journey towards your dream job. :) Good luck!